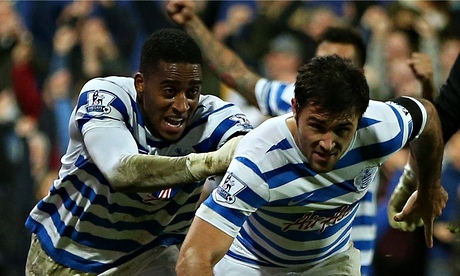 Charlie Austin celebrates QPR's winner against Leicester City, with earlier scorer Leroy Fer congratulating him. QPR saw off Leicester in an action-packed meeting at Loftus Road to start what manager Harry Redknapp described as a “very important period” for his side with a win. This was the first of four winnable home games for Rangers, with Burnley, West Brom and Crystal Palace all visiting west London before Christmas. Redknapp’s players obliged with a hard-fought 3-2 win that lifts QPR above Leicester and up to 18th in the Premier League table – with goal difference the only factor keeping them in the relegation zone. 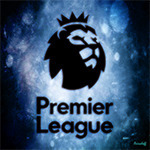 Things started badly for the hosts as Esteban Cambiasso slotted Leicester in front early on – the first the Foxes had scored following a fallow run of 56 days, or 504 minutes of football, without a goal. QPR recovered to dominate the remainder of the first half and led at the break through a Wes Morgan own goal and a first club goal for Leroy Fer. Nigel Pearson’s side hit back in the second half as Jeffrey Schlupp drew them level, only for Charlie Austin to hit his fifth goal in as many games with 17 minutes remaining to settle the contest. Leicester fans had been starved of goals since a 2-2 against Burnley on 5 October, but they only had to wait just only four minutes for the opening goal here courtesy of a measured finish from Cambiasso. Schlupp rolled the ball into Leonardo Ulloa, who was challenged by Nedum Onuoha with the ball breaking kindly to Cambiasso, and the Argentina international needed no invitation to finish accurately past Rob Green and put the visitors in front. Their lead was nearly a short-lived one as Niko Kranjcar’s free-kick was deflected behind for a corner and Fer should have done better when picked out with the resulting set piece. Riyad Mahrez had scored City’s last goal before today, almost nine hours ago in that draw with Burnley, and the Algeria international spurned a great chance to double the visitors’ lead as he steered Jamie Vardy’s pass wide. QPR had yet to test Kasper Schmeichel and their best chance came as Fer cut inside and played in Austin, whose effort was blocked into the path of Karl Henry – but the former Wolves man could only bend a tame shot well wide. Fer was the next to hammer wide before Steven Caulker was unlucky to see a well-struck shot blocked by Morgan as QPR failed to make their ever-increasing dominance pay. With his players proving so profligate, Redknapp saw his side draw level courtesy of an own goal as Morgan could only turn Caulker’s cross past Schmeichel, stumbling over the ball with Eduardo Vargas in close proximity. Green then stopped Leicester immediately re-establishing their lead as he stayed big and denied Vardy from close-range and it was QPR who got themselves ahead before the interval as Austin finally tested Schmeichel with a point-blank header from Barton’s cross and, although the Dane kept it out, Fer was on hand to put his side ahead on the stroke of half-time. Leicester responded well after the interval as Mahrez saw a shot pushed away by Green before Vardy headed a cross from the Algerian against the crossbar. But the hosts remained a threat at the other end as Schmeichel did well to keep out Austin’s drilled effort, with the second half proving as free-flowing as the first as Vardy again wasted a decent chance after a quick Cambiasso free-kick caught the Rangers defence sleeping. The equaliser came shortly afterwards as the impressive Cambiasso showed fantastic composure when collecting the ball at the back post to feed substitute Marc Albrighton. His shot was blocked but Schlupp, who was still dusting himself down having been floored in the build-up, fired in a tremendous 25-yard strike to draw Pearson’ side level. Things nearly got even better for Leicester as Green went missing and Cambiasso’s header was blocked on the line by Henry, with Morgan unable to turn home the rebound. It was QPR cursing their luck next up as the chances to continued to come, with Schmeichel denying Fer from scoring a header. The hosts were ahead from the resulting corner, though, as Onuoha saw his goal-bound effort blocked by David Nugent before Austin was on hand to head home and continue his rich vain of form – converting QPR’s 31st effort of the game as they hung on through six minutes of stoppage time.